Remember those pens I talked about last week? Well I finally got two of them listed in my shop this morning. I took pictures of the other ones, and I will probably list them tomorrow after I think of some good titles. 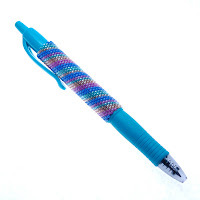 This festive pen features generous swirls of blue, gold, sea foam, and magenta all an an aqua background. Pen writes in blue. This pen features a wild and earthy fusion of color on a forest green background. The whirled color palette includes: light blue, cream, forest green, royal purple, and magenta. Pen writes in forest green. Do you prefer the classic simplicity of the swirl design, or the wildness of the jagged motion design? Please share your thoughts with me in the comments.